Do you like super rich, decadent desserts? 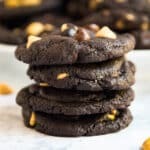 If so, these Peanut Butter Double Chocolate Chip Cookies are right up your alley! Preheat the oven to 340 degrees and line sheet pans with a silat or parchment paper. Set aside. Cream butter and sugar with a mixer until light and fluffy, about 1-2 minutes. Add eggs and vanilla extract and beat until well combined. In a separate bowl combine flour, cocoa, baking soda, and salt. Add into the wet ingredients and mix until just combined. Stir in chocolate chips and peanut butter chips until evenly distributed. Scoop 1 inch balls onto lined cookie sheet and bale for 8-9 minutes. Don't over bake. The cookies will be soft and chewy; they will puff when the bake and flatted as they cool. Cool slightly and then remove from the sheet pan. Serve warm or completely cooled and store for up to a week in an air-tight container with a slice of bread in it (to help the cookies maintain their chewy texture).